Update July 2017: Please check the official Nitetronic site for the latest information. Nitetronic has released a new pillow that is softer and has more features. The review below is for the previous version of the pillow. It was only a matter of time for another anti-snoring smart pillow to come on the market. When I discovered the Nitetronic goodnite™ Anti-Snore Pillow, I knew I had to try it out and see if it was effective. Nitetronic is a German company that started in 2011. The company has been successful in Europe, selling over 10,000 units and has now entered the U.S. market. The Nitetronic goodnite™ Anti-Snore Pillow monitors your breathing sounds and head position on the pillow throughout the night. It has air chambers and sensors built into the pillow which detect snoring and will gently turn your head to the side to stimulate the relaxed muscles that are causing you to snore. These pillow movements are gentle enough that they do not wake the user or your bed-partner. If snoring begins again, the pillow simply inflates again. Setting up smart devices isn’t always easy, but this pillow is straightforward. Just switch out your current pillow with the Nitetronic pillow and plug the pillow into your nearest outlet. Place the base on a nearby nightstand or near you on the floor and download the two Nitetronic apps that work with the pillow. Nitetronic has developed two apps to work with its Anti-Snore Pillow. The first app is the Nitelink App from Nitetronic. 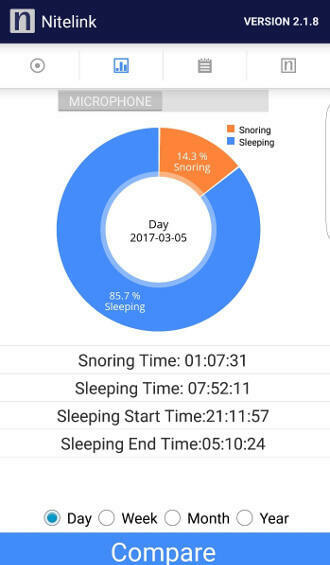 This app is used to record your snoring using the microphone on your mobile phone. I downloaded the Android version of the app and it worked well. It was on par with other sleep apps like SnoreLab. This app does appear, however, to still be in development, as the app shows some Chinese characters. The second app developed by Nitetronic for its Anti-Snore Pillow is the Nitelink2. The Nitelink2 app monitors your snoring by connecting the pillow with your phone through Bluetooth. For those of us who like to see the numbers, the app produces a sleep efficiency score for you to view in the morning. This app has good data results, such as head position charts and information on your sleep. 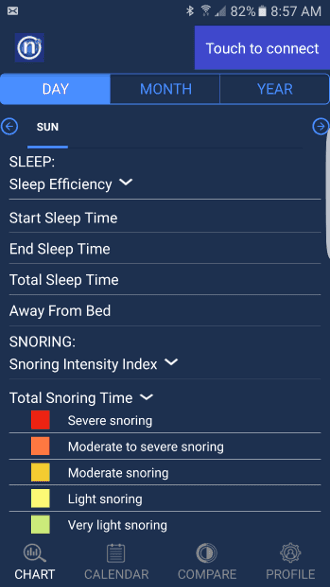 Nitetronic developed the Nitelink2 app to enable you to get a baseline snore percentage that can be tracked over time. Nitetronic suggests using just the app (and not activating the pillow) for three nights, to set your baseline snore percentage. After getting your baseline, Nitetronic recommends turning the pillow on so you can track whether your snore percentage decreases with continued use. First, I have to say that the only real problem is this is a firm pillow and overall uncomfortable at first. The first night, I only used the Nitelink app (I started using the Nitelink2 app later on) without the pillow activated to see what my snoring percentage was. I ended up with a 14% snore rate. This about the same as my long term average using the SnoreLab app on Android of 15%. This pillow is very firm, and it was difficult to fall asleep. During the first part of the night, I woke up once when the pillow inflated. I do not know if that was the only time it inflated. The inflation on the pillow was slight and hardly noticeable. The engine does make a little noise when it is inflating. I also woke up at 3:45AM and was unable to fall back asleep for the rest of the night. I suspect it was because I was not used to the pillow. During the time I was awake, the pillow inflated even though there was no snoring. I suspect that running a heater or fan nearby or having your partner get out of bed in the middle of the night triggers the pillow to inflate. The app said I snored 5% of the night. This is really good, and compared to my SnoreLab long term average of 15%, the Niteronic did reduce snoring. I decided to continue using the pillow using the SnoreLab app as this is my standard for snore testing. After several nights I was used to the pillow firmness. My snoring rate was approximately 50% lower with the Nitetronic. Snore snore was 12 on SnoreLab, my lowest ever. My snore recordings with the Niteronic sound like heavy breathing instead of snoring, so the pillow does work to reduce both snore quantity and volume. In the future I will be testing this pillow in combination with mouthpieces, nasal dilators and other anti-snore devices. Stay tuned for blog posts on that. The Apps. 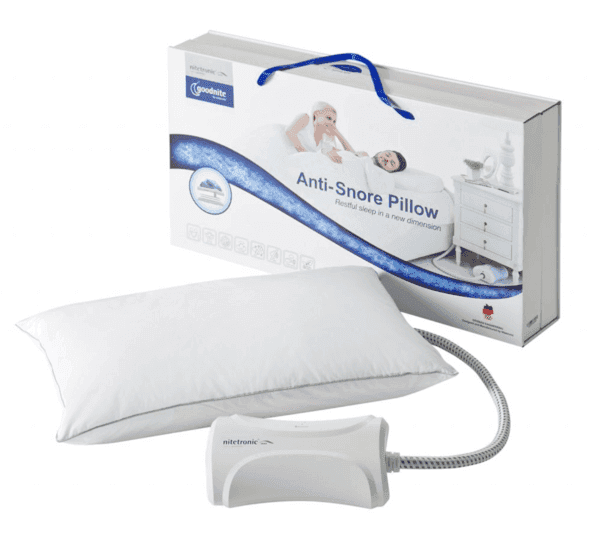 The apps that work with the Nitetronic goodnite™ Anti-Snore Pillow are awesome. The apps can also show charts of your head position on the pillow, which can be useful to show you which position you snore least in. I used the Android versions, but the apps are available on both iPhone and Android devices. Ease of Purchase, Trial Period and Warranty. Ordering the pillow from the Nitetronic website is easy. The site accepts PayPal and the company emailed me an $80 coupon when I first registered on the site. Shipping is free and customer updates are integrated with Facebook. This high-tech device includes a 1-year warranty on the pillow. Can be used with Other Devices. While the pillow is not meant to be a CPAP machine replacement, it can be used with a CPAP or a snoring mouthpiece to get even better results. No Delay. This pillow needs to include a delay function on it because it starts to inflate while you are lying in bed talking to yourself (or to your wife!). Most smart pillows and apps have a 20-40-minute delay before they start listening for snoring, to allow you a chance to fall asleep. The Nitetronic pillow does have a setting that allows you set a start time, but if you go to bed at different times, this function is not as valuable. Not a completely risk free trial. Nitetronic’s return policy states a $50 restocking fee. If you like a firm pillow, then the Nitetronic goodnite™ Anti-Snore Pillow might be the pillow for you. Snoring rates are lowered. The sensors work very well and the apps provide informative insight to your sleeping habits. Order at the Official Nitetronic website here.